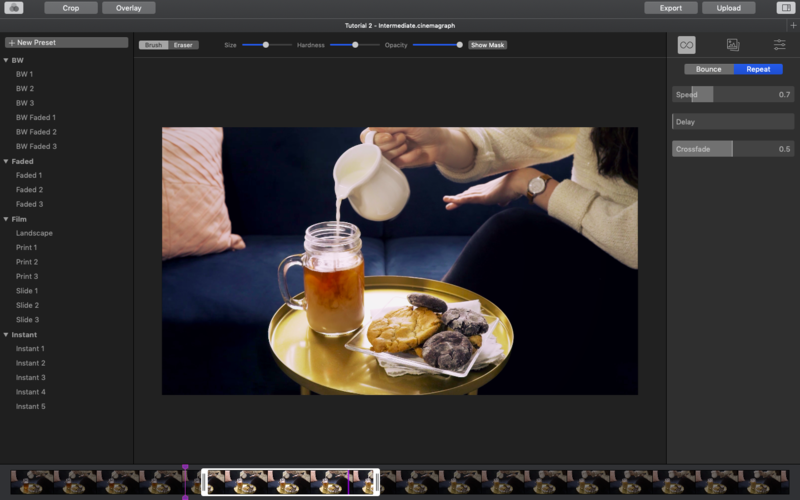 Continue reading to learn how to navigate the app and create cinemagraphs in Cinemagraph Pro for macOS, step-by-step. When you open Cinemagraph Pro for macOS, you will be greeted with a welcome window. On the welcome window, you can open your recent documents along with tutorial documents used in the getting started, intermediate, and advanced tutorials. These tutorials and others can be viewed under the tutorials tab so you can follow along and practice what you learn. You can also visit other resources from the welcome window including our forums, galleries, blog and more. 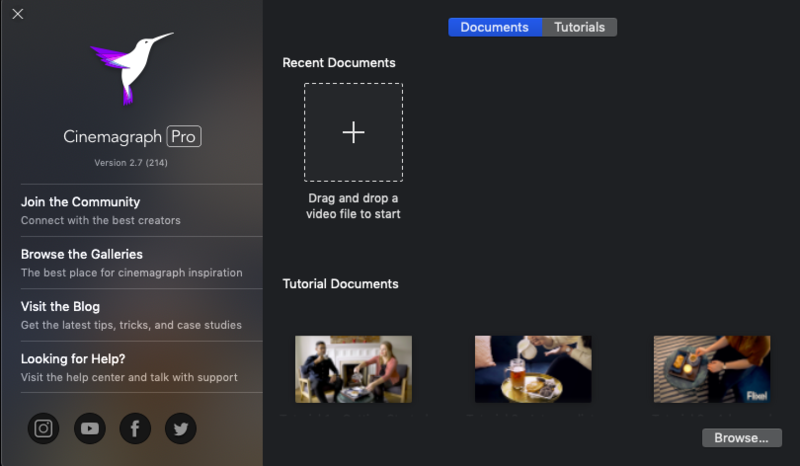 Once you create or open a document, you can start editing your cinemagraph. The timeline located below the cinemagraph preview is where you will trim your video and select a still image. To reveal motion from your video, you will hover over the still image and paint over selected areas. You can switch between the brush and eraser and adjust the size, hardness, and opacity of both tools in the toolbar located above the cinemagraph preview. From the toolbar you can also open the preset library, enter crop and overlay modes, and share your cinemagraph. 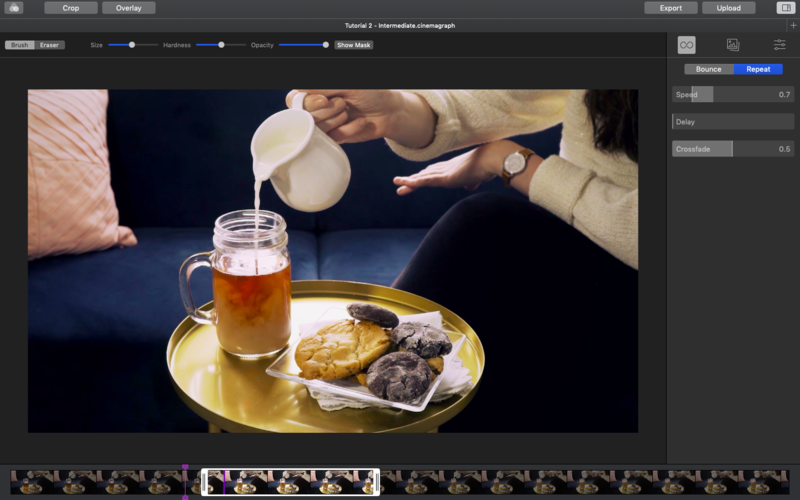 From the sidebar located to the right of the cinemagraph preview, you can select a loop type, import or export a still image, and make various adjustments. Other editing options including undo, mask and unmask all, and nudging the trim range can be performed under the Edit menu or by using keyboard shortcuts. Drag and drop a video or image sequence into the welcome window or select Browse to create a new document. A new document may also be created under the File menu or using the keyboard shortcut ⌘N (Command-N). Drag the trimmer handles on the timeline to select the content of your cinemagraph. Drag the still image selector (purple marker) anywhere on the timeline to select a still image from your video. If you do not want to select a still image from your source video, you can import a new one from the still image tab on the sidebar. Use the brush tool to paint a mask on the still image and watch your cinemagraph come to life in real time. If you make a mistake, select the eraser tool in the toolbar or use the keyboard shortcut X to toggle between tools. Use the sliders to adjust the size, hardness, and opacity of the brush and eraser. Select the loop that looks most natural under the loop tab in the sidebar. By default, a repeat loop is selected which will repeat the motion in your cinemagraph from beginning to end. A repeat loop works best for motion that travels in a single direction, while a bounce loop works best for motion that travels back and forth. Adjust the speed, crossfade, or add a delay in the motion of your cinemagraph. You can only adjust crossfade for repeat loops, as it will determine the type of transition between the end and beginning of your trim. Increase the crossfade to produce a gradual transition between loops and decrease the crossfade to produce a more sudden transition. Go to the adjustments tab in the sidebar to adjust the color, light, tone curve, and vignette. You can also browse through a library of filters under the presets tab in the toolbar or create custom presets. Click on the crop button in the toolbar to crop, straighten, rotate, and flip your cinemagraph. Click Done in crop mode when you are ready to return to the main editor. Click on the overlay button in the toolbar if you want to add images or text on top of your cinemagraph. Click Done in overlay mode when you are ready to return to the main editor. 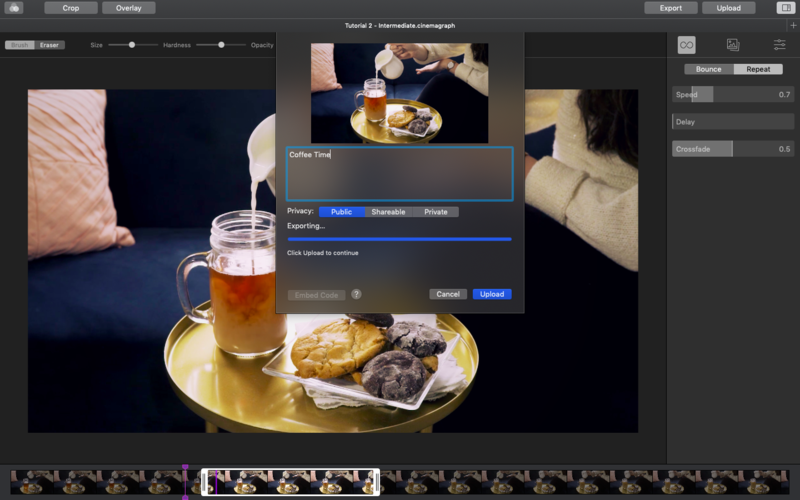 When you are done editing your cinemagraph, click on the export button in the toolbar to export your cinemagraph. You can select the file format, size, frame rate, and number of repetitions or simply select a preset to optimize your cinemagraph for one of the listed export destinations. Click on the upload button in the toolbar to upload your cinemagraph to your Flixel gallery. Upload your cinemagraph as public for the chance to be featured in our galleries, social networks, and compilations. You can change the privacy and sharing settings for your cinemagraphs anytime on your flixel.com profile.